The Curse of Caste; or the Slave Bride was published serially in The Christian Recorder. It belongs to the sentimental genre, with an angelic young heroine who has a mysterious past. The serial style of its publication emphasized the melodrama even more, leaving readers hanging from one entry to the next. 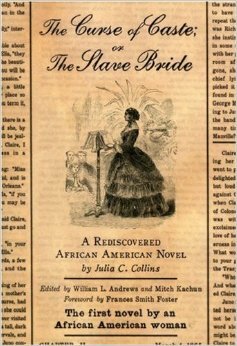 Julia Collins did not publish The Curse of Caste; or the Slave Bride in chronological order. It begins with the story of Claire, a young woman growing up in the North during the tail end of the Civil War. When the reader first meets her, Claire has just completed her education at a women’s seminary and is intending to take a job in the Southern city of New Orleans, working as a governess. It is clear that there is a mystery to Claire’s life that even she cannot fully understand. As an orphan, she was raised by an African American woman named Juno who tells her nothing of her parentage and even warns against her going down South. She offers no explanation for this warning and we as the readers, along with Claire, are equally frustrated and curious. The mystery of Juno’s warning to Claire is revealed in a brief detour from the main plot. Collins takes the reader into the past, explaining the connection between Claire and Colonel Tracy, her employer. By the time the focus of the story returns to Claire, readers find themselves engaged in the drama and mystery, rooting for a happy ending for all. To read a preview of The Curse of Caste; or the Slave Bride and purchase a copy in its entirety, click here.